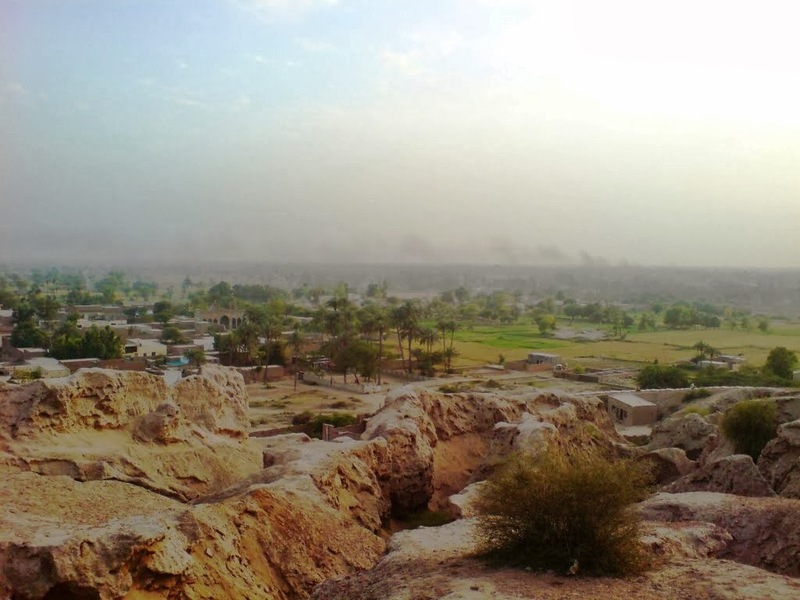 The rather unremarkable town of Shorkot is usually associated with the nearby Rafiqui Air Base. 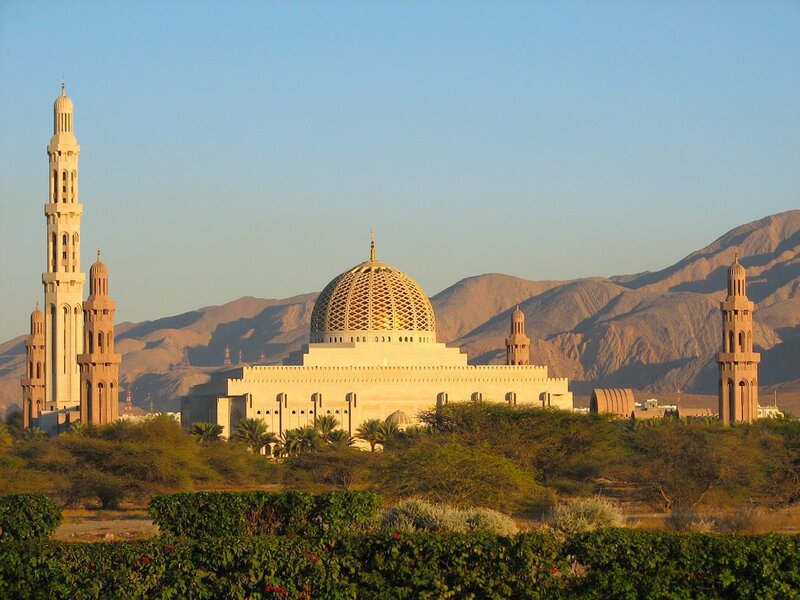 Many an Air Force officer has had a heartburn on hearing of posting to a place that is sizzling hot, off the beaten track, and has little to show except a rustic landscape interspersed with odd groves of date palms. Shorkot stands as a last outpost of fertile Punjab, west of which lies the cheerless Thal Desert. The two contrasting eco-regions are separated by the Chenab River which meanders a few miles west of the town. Except for the roar of supersonic fighters flying overhead, life seems slow as the bullock carts steadily wend their way past an eroding mound, around which Shorkot town sprawls today. Rising 80-odd feet above the adjacent buildings and surrounding fields, the lofty mound known locally as a bhir, is square in shape, testifying to obvious human intervention in what was once a massive natural outcrop of mud-rock. 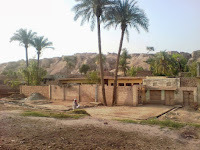 What remains of the mound after erosion by elements and encroachment by land-grabbers, measures about 11 hectares in area. 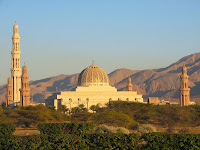 When I first saw the mound many years ago, my query as to what the structure might be was promptly answered by a passer-by, “Sikander-i-Azam ka qil’a”. Always a little sceptical of Alexander’s overblown exploits – at least in what is now Pakistan – I decided to dig deeper, so to speak. An appointment with a local school teacher, the late Mr Jamil Bhatti, saw me at his house at the foot of the mound. An amateur collector of artefacts from the mound, Bhatti had become an authority of sorts on Shorkot’s antiquity. Since the mound is not an officially protected monument, Bhatti thought it proper to collect various items that surfaced after rains, which would otherwise have been pillaged by the locals – a practice that continues, nonetheless. He had converted his living room into a little museum, in which were displayed several copper and bronze utensils, numerous coins, a large quantity of beads and the usual terra cotta potsherds. His collection (now displayed at the newly constructed, private Lyallpur Museum) has been a convenient source for determining the chronology of the site, at least at the upper levels of occupation. Archaeologist and anthropologist Jonathan Mark Kenoyer, the premier authority on the Indus Valley Civilisation, has had a look at Bhatti’s collection. In his book, The Ancient South Asian World, Kenoyer postulates that agate and carnelian prayer beads with painted stripes similar to the ones shown by Bhatti, became common in Northern India around 600 BC. Similarly, he thinks that the multi-coloured glass beads found at the Shorkot mound are similar to the ones found in Greece and the Mediterranean area; these may have been brought in by Persian traders as well as Greek mercenaries hired by Persians when Cyrus the Great conquered parts of Afghanistan, northern Indus Valley and the Punjab between 558-529 BC. Greek figurines and coins found at the site indicate that some Greek soldiers may even have settled at the site. The next time you spot an olive-skinned and hazel-eyed local from Shorkot, you wouldn’t be wrong in assigning him a Mediterranean pedigree! Much later in 326 BC, Alexander is said to have passed by Shorkot on his way out of India, along the Indus River. His army would, however, have been too fatigued and in much of a haste to tarry longer than a few days. After all, his incessant campaigns had lasted several years and had taken their toll. This was evidenced by a mutiny of his exhausted troops when Alexander was prevented from campaigning in the Indian heartland, after hitting Beas River. It is, therefore, unlikely for these later Greeks to have left behind any enduring biological or material vestiges during their fleeting passage out of India. In 1906, some men digging the foundations of a house near the mound, chanced upon a number of copper and iron utensils of considerable antiquity and uncommon design. The artefacts were acquired by Lahore Museum, and were catalogued and properly cleaned. 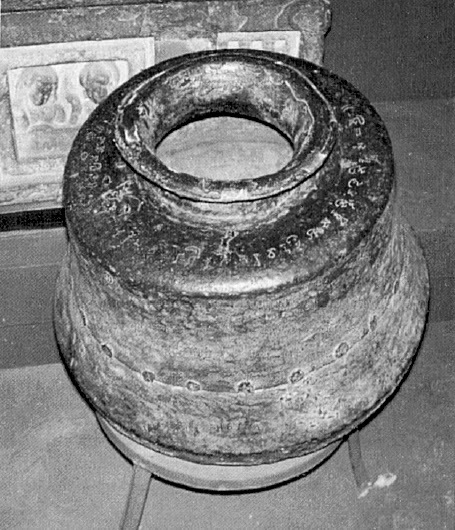 It was only noticed then, that a mid-sized copper cauldron (not too different from our ‘degs’) measuring 21” in height and 22” in diameter had a Sanskrit inscription on its shoulder. Written in Brahmi script, it reads: “The Year 83, (the month of) Magha, the bright fifth day, dedicated by the administrator Buddha-daso-thapita (Buddha’s appointed slave) to the community of monks of the universal Sarvastivadi Order belonging to the Radhika Monastery in Holy Sibipura”. The Gupta year mentioned corresponds to 403 AD which was the peak of the Golden Age of Guptas. A similar copper vessel found in a monastery near Tarbela in 2000 attests to a Gupta cultural imprint, as far as the Gandhara domains centered around Taxila-Tarbela area. The citadel of Shorkot housing the monastery thus marks an important religious, and possibly the political centre of Sibi country, Sibi being a prominent tribe often mentioned in Sanskrit literature. Sibi people (also written as Sivi) are mentioned in Rigveda. A Jat clan by the name of Sibia, still exists in India today. While the Ayodhya-based Guptas had overrun much of central India, present day Punjab, Sindh and Rajasthan remained feudal tributaries. To keep the annual tribute from the Sibis flowing, as also to keep an eye on possible Persian forays, a frontier garrison at the western-most limit of Gupta influence was in order. The Shorkot citadel may, thus, have been the handiwork of any of the first three Gupta Kings under whose rule, the Gupta Empire continued to expand. Evidence of this citadel appears as a baked brick circular bastion, besides other brick structures towards the north-western side that have been exposed by rain erosion, as well as earth removal by the locals. As Bhatti took me for a walk around the mound, he confided that he owed part of his collection to his school children. “They are allowed to go off from classes and hunt for coins and other artefacts that wash down whenever it rains. You have seen the results”, he continued, almost urging me for an endorsement of his unusual methods. I did agree that the interest of the youngsters in archaeology must have increased manifold with such field research! 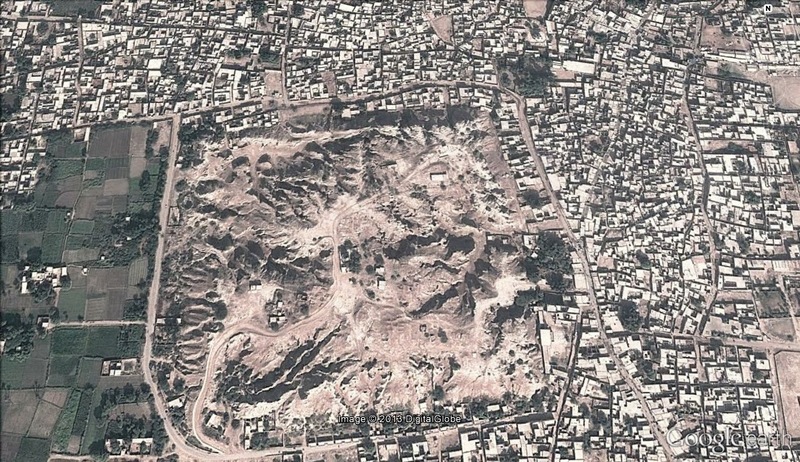 According to Bhatti, the Shorkot mound had been disgorging artefacts from times immemorial, and his hunch was that his city represented the continuing Harappan tradition after the functional order of the Indus Valley cities had broken down. He hoped that more organised archaeological work could be undertaken at his cherished site. The erudite Kenoyer (who interestingly, speaks Urdu and Punjabi with relish) explains that the social and political state of affairs of the Indus Valley Civilisation started to ‘transform’ after about 1900 BC, known as the Late Harappan Era. This was due to complex processes of change, including overextension of economic and political networks and changing river patterns along with periodic floods, that disrupted the agricultural base of its major centres of production. This transition from an integrated and centralised political structure of the Mature Harappan Era (2600-1900 BC), to numerous competing local polities continued till about 600 BC, when various Indian and foreign dynasties started to take hold. In Kenoyer’s words, these were ‘multiple centres of influence’ compared to the earlier ‘integrated’ order. Shorkot, like over 200 similar sites in Pakistani Punjab that are marked by prehistoric mounds, attests to this localisation of the Harappan tradition. We will have to wait for the Department of Archaeology to organise a digging project in earnest, to be sure about Shorkot mound being rooted deep in the Late Harappan Era. This brief Sibipura narrative would have remained incomplete if I hadn’t seen and described the copper vessel that was supposed to be lying at the Lahore Museum. I was, however, disappointed to learn that there was no trace of it and the senior staff told me that, “it must have been transferred to India in 1947”! Quite obviously something was badly amiss, since I had read a research paper written in 2004 by Harry Falk of the Institute of Indian Philology at the University of Berlin, in which he says this about the vessel: “Today it is on display in the Lahore Museum”. To me, it was more than just an empty cooking cauldron that was dedicated to the monks of Radhika Monastery. I would like to think that it contained a lavishly cooked offering for religious purposes; perhaps it was saffron coloured rice sweetened with brown sugar (‘gurr’) – complete with a garnish of coconut slivers and luscious raisins – which the monks had partied on. Would not that event in Sibipura make it one of the oldest recorded instances of ‘deg charrhana’, I wondered? This article was published in the daily newspaper The News International on 1 Dec, 2013 under the title Walking Around an Ancient Mound. A couple of years ago, while observing satellite pictures of the Indus Delta, I spotted a tiny reddish speck on one of the islands. Zooming in, I noticed that it looked like the remains of a square fort-like structure. Its location on a marshy mangrove island confounded me no end, and megabytes of Googling could not help me come up with an answer. I consulted my friend Adil Mulki, who is basically a banker but with a flair for excellent research on anything of historical interest. He knew of the island and the remains of a fort on it, but was equally unsure about its origins, so we decided that on the next opportunity we should explore the place together. That opportunity came last February, when I was visiting Karachi. Adil had done some meticulous planning for the trip, attending to each and every detail, including coordination with the boatman, and arranging for a load of fruit, snacks and plenty of bottled water. He had also roped in his friend Sharjeel Ahmed for bigger company. Our initial destination was Bhanbore, to which we set off in Adil’s car early at 5 o’clock in the morning; after a little over an hour we reached Bhanbore via the National Highway. The car was parked in a shed near the small jetty, and we promptly transferred the eatables in the boat that was waiting for us by the banks of a muddy creek. The diesel engine puttered to a noisy start and continued to rattle our ear drums till we got back in the evening. No luxury yacht, our boat reeked of dried fish and diesel fumes, and was dirty as a gutter but we couldn’t complain. After all, one couldn’t expect much from the crew of the boat, themselves wretched souls like many others plying the Indus Delta. We were headed to Jhaki Bandar which is, supposedly, a port of sorts on the island and a mere 20-km as the tern flies from Bhanbore. Meandering around the creeks, however, it is 35-km away. The Indus Delta is a placid network of waterways, thick with silt picked up by Indus River during its traverse of 3,180-kms, starting from its source at Senge Khabab in western Tibet. In the delta, this silt forms mangroves swamps with a rich aquatic bird life. Curious-looking darters and cormorants perched on mangrove branches could be seen drying their outspread wings, absolutely motionless almost like cardboard cutaways. Except for the boat’s outboard motor, nothing seems to have changed since ages and the scene around us could well be harking back to several millennia. 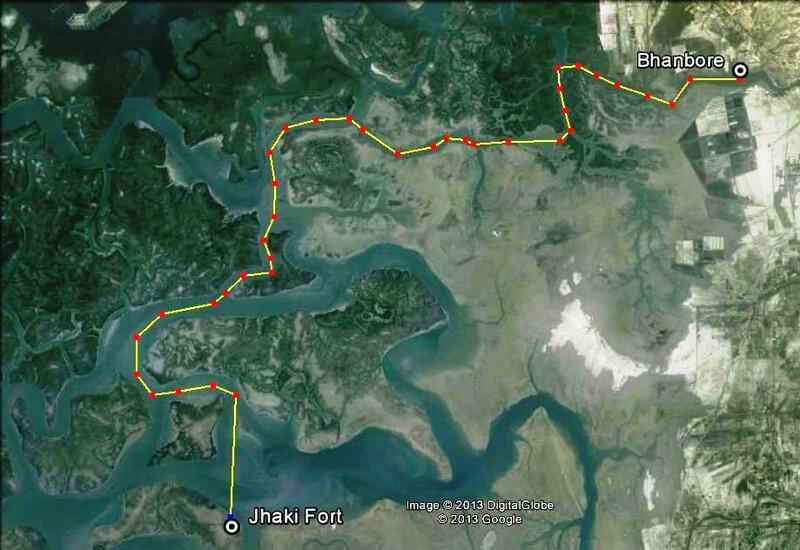 It took us three-and-a-half hours to get to Jhaki Bandar, and it was a while before we reoriented ourselves. The ruins of the fort stood out as a low red wall from a distance. A fishing boat was docked nearby and there was no sign of a port or any other structure, for that matter. Jhaki Bandar, we concluded was just a way station where the fishermen stopped to refuel from their jerry cans, or stopped to cook some sea food for lunch. The boat was stopped short of the muddy beach with barge poles, and we all got off with our trousers rolled up to the knees, trudging a few yards in what was water, then sludge and finally soggy land. It was decided to first take a walking tour of the fort walls, utterly ruined as they were. At their base the baked brick walls are about one metre thick, and the height of what remains of the walls is about two metres at most. The bricks were quite unusual, being about the size and thickness of an average paperback novel, similar to Mughal bricks but somewhat larger. The square fort has sides roughly 100 metres in length, with four corner bastions and another eight in pairs on each wall. The south-eastern quarter of the fort indicates the remains of what may have been several rooms. The fort opens to the East and is located at the tip of a triangle whose base is formed by a line joining the towns of Gharo and Mirpur Sakro, about 22-km away at the perpendicular. The area between the Eastern wall and the beach is littered with thousands of potsherds. The designs painted on the terra-cotta pottery include zigzag patterns, six-spoked circles, inter-locking S-shaped motifs and chevrons. Some of the designs were etched instead of being painted. Many glazed pottery pieces with blue painted patterns on a white background could be also be seen. No human or animal motifs were visible on the potsherds. Intriguingly, more than one object could be interpreted as a lingam. Many perforated pottery pieces, similar to the colanders seen at Harappan sites, were also visible in the debris. Potsherds were the major debris seen at the site. An exception was a round metallic object which looked like a punch-marked coin. The boatman assured us that it was indeed a coin and he had picked up many which were lying at his home. Having to leave before the low tide set in – with the risk of the boat getting stranded in sludge – we shuffled back to our vessel before mid-day. It was also time for a meal of shrimps that was to be cooked on board for Adil and Sharjeel (me having a dull palate for crustaceans). 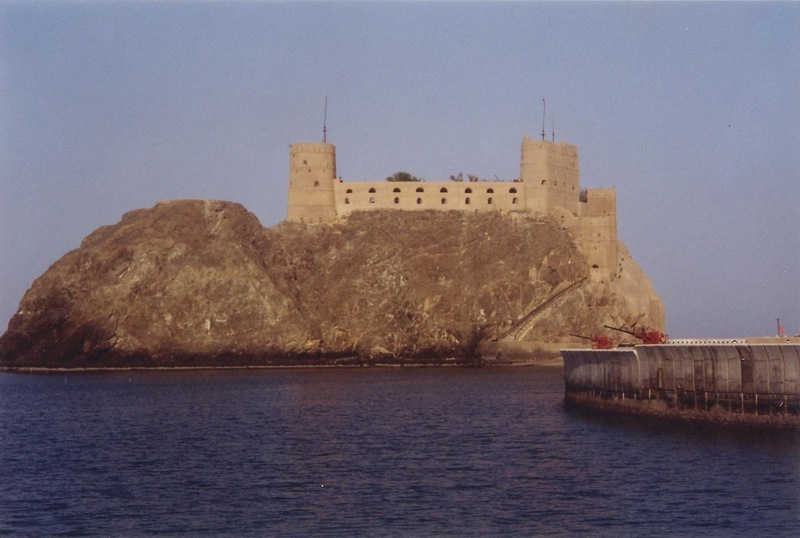 For what purpose was the fort built, by whom and when? Neither of those questions elicits a definite answer from any known write-up, except for a brief mention of the “fort of Bandel at the entrance of the river (Indus)” in History and Discovery by Portuguese in the New World by P J François Lafitau. This brief account at least confirms that the concept of coastal forts in Sindh was in vogue some time before 1555. It is possible that in the wake of the sack of Thatta, a lesson had been learnt, and more forts at the mouths of Indus Delta estuaries had been built for defensive purposes. Quite similar in purpose to the modern day Coast Guards outposts, these forts may also have served the purpose of customs offices to extract duties on goods being brought into Sindh coastal waters. After all, much needed revenues had to be shared with the Sultans of Delhi and later the Mughals, under whose suzerainty and patronage the rulers of Sindh held power till the independent Kalhora rule started in 1701. 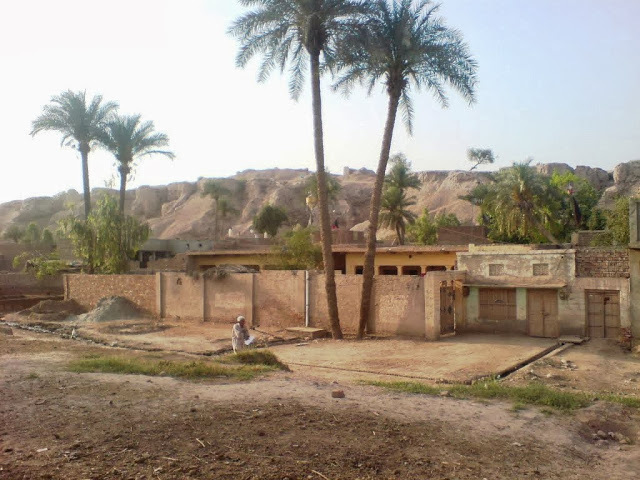 Four such forts have been mentioned by the Sindhi scholar Dr N A Baloch, viz Manhora (Karachi), Ratokot (Gharo Creek), Vikkur (near Jati) and Kotri (off Kori Creek), all attributed to the Talpurs, though the source of this information has not been quoted. 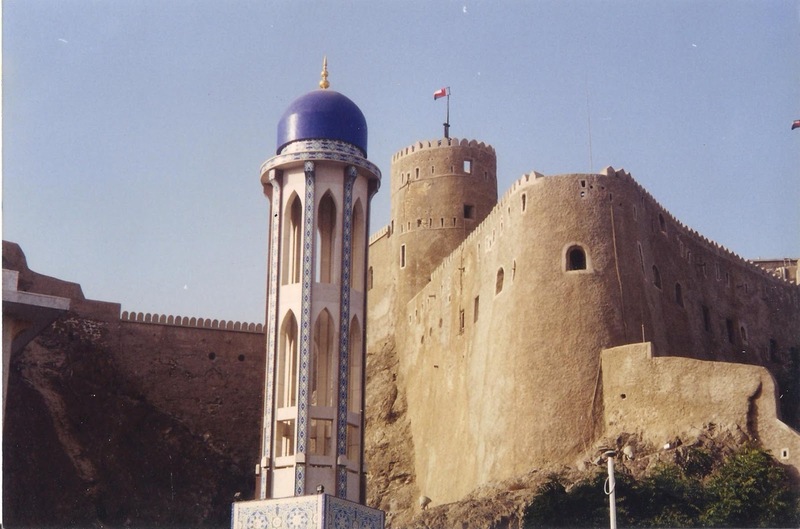 The fort at Jhaki Bandar has intriguingly been missed out by Baloch, but it has to be granted that the modern day locations of forts may not correspond with the names that have been recorded by historians. This is because of relocation of the ports due to silting, which has been the bane of the Indus Delta since eons. The matter is also complicated by the fact that the forts being of red brick, are commonly known as red fort or rato kot in Sindhi, while the actual name of only one is Ratokot. If you can’t tell one from another, the blame is not yours. There has been some mention of the fort at Jhaki Bandar as being a forward stronghold for the defence of the ancient town of Bhanbore. Suffice to say that the former is of baked bricks while the latter is constructed of quarried stone, and both are widely apart in shape and the design of ramparts. To us it seemed that there was no connection between the two and couldn’t have been contemporaneous by any stretch of imagination. 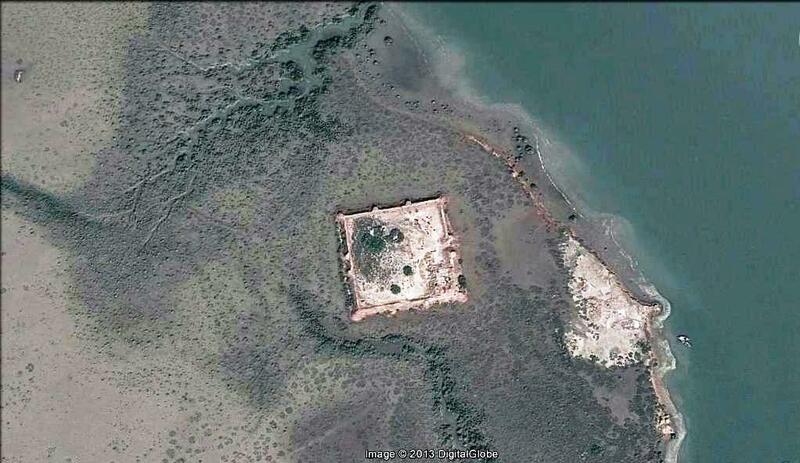 The boatman, however, suggested that it was Raja Dahir who was the mastermind behind the fort at Jhaki Bandar. We won’t be surprised – in a sign of the times – if we next hear of it as being Muhammad bin Qasim’s handiwork! With heavy tans, parched lips and muddied legs, we disembarked from the boat, paid off the boatman and drove off to nearby Bhanbore. After guzzling some much needed beverages, we did a quick survey of the site and also visited the small museum. We got back to Karachi after a full twelve hours, though the tiredness vanished as Sharjeel regaled us with some amusing stories. During our short trip to Jhaki Bandar, we may not have been able to come up with any definite answers; yet having studied the issue a little more since then, it can be surmised that these coastal forts belonged to the 16th-18th centuries CE. They served the dual purpose of guarding the entrance to the creeks, and housing customs offices at the rudimentary ports of the Indus Delta. Further research could be centred on study of potsherds to determine the cultural affiliations of the people who used them, along with a study of the coins to help confirm the era. Only then would the mystery of the fort in the Indus Delta be unravelled satisfactorily. This article was published in the daily newspaper The News International on 18 Aug, 2013 under the title Mysterious Speck in the Indus Delta. 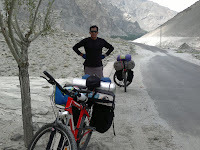 Having successfully undertaken an arduous bicycle trip from Gilgit to the northern-most latitude of Pakistan at Kilak Pass in May 2012, I and my former Air Force colleague Shahid Dad pledged to keep our fast-aging sinew and muscle in action over the coming years. So thrilling was the previous wind-in-the-face biking expedition – with camping halts in the midst of snow leopard trails – that we promised ourselves a perennial treat in the Himalayas. It was decided that for 2013, Baltistan’s Shyok Valley would be the place to explore, via the road from Skardu till its termination at the base of Siachen Glacier near Goma. Of course, Army contacts would take care of our forays into operational areas if we could make it that far. Arrival at Skardu by PIA’s ATR-42 aircraft – aptly named Hasanabdal, for that is where my alma mater was – would have been a happy occasion, except for the rude discovery that our luggage had been left behind at Islamabad. With a lot of string pulling and a bit of good luck, the luggage arrived the following morning while we waited it out in an Army guest house amidst the serene surroundings of Lower Kachura Lake, on the outskirts of Skardu. Our bikes, which had been earlier booked by bus, also arrived and we managed to assemble them for a test ride the next day. Shigar evoked memories of a wondrously vigorous Air Force colleague of yesteryears who carried that surname, so a visit to his fabled land would also satisfy our curiosity about his community, we thought. In the event, it turned out the Shigaris are less energetic than our friend who was one of his kind, though a hardy and stout people they certainly are. After three hours of cycling we were lucky to stumble into a store which kept ice-cold beverages, and we made sure that dehydration wouldn’t rear its head again as bottle after bottle was guzzled in front of amused onlookers in the shabby Shigar bazaar. The high point of our trip to Shigar was the discovery of an ultimate getaway in the form of Shigar Fort Residency, the palace of the former Rajas and now a renovated heritage guest house run by the Serena Hotels chain. The exotic 17th century fort-palace at the foot of a mountain is highly recommended for honeymooners, as well as seniors who might want to revitalize their sagging proclivity for fun. Being on a serious expedition, tired and hungry, we could do no better for ourselves than ordering a nourishing lunch. While it was being readied, we took a guided tour of the palace, which included a peep into the prisoners’ hellish dungeons in the basement and a stroll through the Raja and Rani’s heavenly bedrooms, separate as they were. The sumptuous lunch by the side of a hill torrent cascading out of Thalle Valley could, unhappily, not be prolonged as we still had a laborious journey to complete on utterly spent muscles. Thank goodness, by the end of the day we had completed the 55-km trial run, the bikes had behaved perfectly and we were well in time at Skardu to tend our sore limbs. Our expedition proper started next day, the 13th of June, with the first of the six 50-km legs terminating at Keris, a village where Shyok River joins the mighty Indus during the latter’s north-westerly traverse. Somehow, the limbs sprang back to full pedalling efficiency, and by late afternoon we were in the village scouting for a camp site. Shahid was able to convince a friendly villager to allow us to camp adjacent to his orchard. The sooner we started to pitch our tents, hordes of children started to congregate, for the novelty of seeing camping tourists – even though natives – in their midst was too much to let go. The colourful tents surrounded by even more colourfully dressed children gave the impression of a gala event in Keris. By evening, word had spread about the visitors and almost every boy and girl of the village had managed an awe-struck glimpse of our campsite. Most touching was a gesture from three little girls who brought handfuls of sweet mulberries for us. An early supper being heated on the camp stove was also very entertaining for the onlookers. Soon after we had retired, a thoughtful local brought a heavy jerry can of drinking water which could have sufficed for our bathing needs as well. After a restive night – as anyone who has been sandwiched in a sleeping bag would know – we were woken up by an incessant melodious whistle that was bird song at its best. A Blue Whistling Thrush (Myiophoneus caeruleus) had taken upon itself to wake us up at 4:30 in the morning. Soon we were at the nearby stream for a wash up, followed by stove-cooked breakfast of oat meal and hot chocolate. Camp was then broken, and everything packed and trussed up on the bikes. By 7 o’clock, we were on the road again. 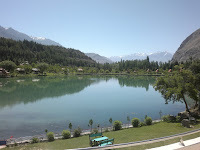 Khaplu, nestled amongst lush green orchards of apricots, apples, cherries and walnuts, was our next stop. The small town was once the seat of another petty principality, to which the splendidly restored Khaplu Fort Residency testifies. It is from Khaplu that most mountaineering expeditions veer off towards various base camps. A well stocked single-street bazaar caters to their basic requirements. The consumer lifestyle of the locals was surprisingly in evidence, perhaps a result of the influence of these trekking groups and climbing expeditions. 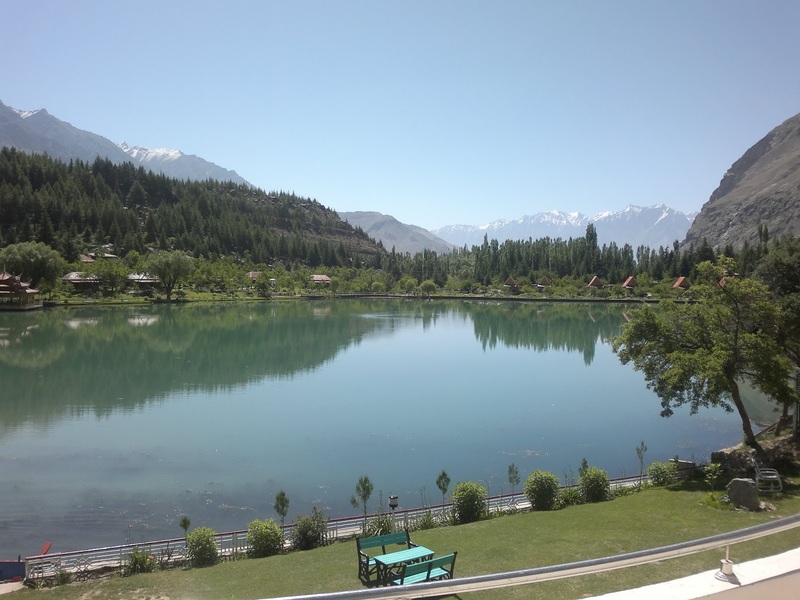 Too tired for sightseeing in Khaplu, we decided to take a day’s break on the return leg and hastened to the PTDC Motel where we had a booking. 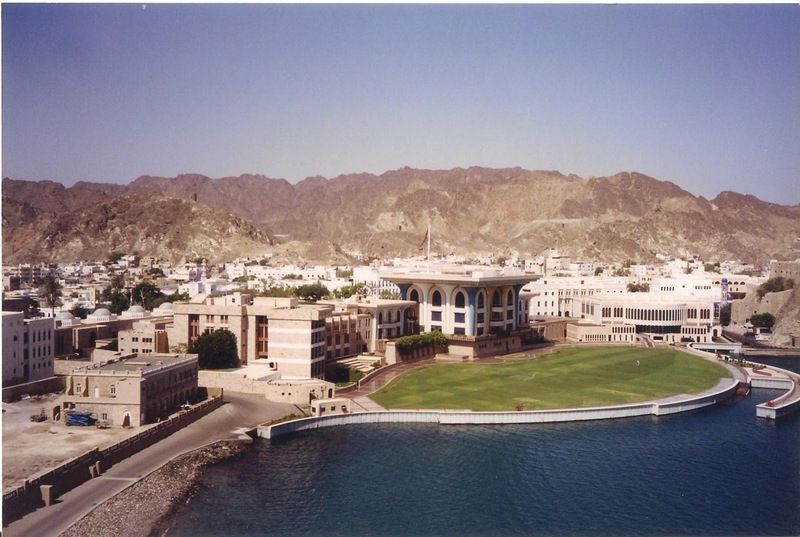 The beautiful structure looks like a Swiss chalet from afar, but we were disappointed to discover appalling house-keeping and general apathy that now seems to afflict every government-run organisation in the country. After some livid dressing down administered to the staff, we made sure that the bathroom taps worked, dangling curtains were re-hooked and the bed linen and towels were changed. With a much needed bath, laundry and lunch out of the way, we reviewed our plans for the next day as the climb gradient was getting to be steeper on every leg. Since the next two nights were to be in the Army Mess at Dumsum (Dansem), we decided to leave the camping gear at the motel, to be picked up on return. The third leg started with an entry into areas where the Army was deployed, but since the authorities had been informed earlier, getting past the quizzical eyes of the sentries at various check points was never a problem. A cool rainy morning and a much lighter bike load helped negotiate the steep slopes with considerably less effort. The terraced emerald-green fields steadily crept upwards as we climbed, and the fruit orchards started to give way to the more hardy turnips and potatoes. Traffic had thinned out and only military vehicles, or those of civilian contractors provisioning the Army garrisons could be seen on the road. Just when six hours of rigorous cycling had started to take its toll, an MP post came into reassuring view and the sentries smartly paid their compliments. A few kilometres further, we caught sight of the Dumsum garrison buildings. As we approached the entry gate, a flurry of whistles and rifle slamming salutes welcomed us; even more surprising was the reception by the Officer Commanding of the deployed Unit who, along with all his officers, had lined up to receive us. Thereafter started an unending round of Army hospitality of which a hot bath, hot tea, and a multi-course dinner are still etched in memory. While we had planned to pedal up to Goma garrison the next morning, the Army authorities offered us a ride on their daily mail run vehicle all the way to the Siachen base camp at Giyari. Since this could not have been done on bikes, given the very steep gradient as well as the high altitude, the offer was gladly accepted. After an hour-long drive, we had a short stopover at Goma where the smart Brigade Major was there to receive us. After a change of vehicle, we were on course to Giyari, a further eight kilometres away. The place made morbid headlines on 7 April 2012, when an avalanche buried 140 personnel of 6 NLI Battalion, perhaps one of the biggest disasters of its kind, anywhere. Mention must be made of Captain Sherazi of the Army Engineers, who had been part of a recovery team looking for the dead bodies for more than one year. Various foreign rescue and recovery teams had suggested giving up the dead, due to the extremely harsh conditions and near impossibility of bringing in heavy machinery to such a remote location. Undeterred, the Army decided to take on the challenge, and under the passionate zeal of Sherazi and his team, 132 bodies had been recovered by the time we visited. A closure ceremony, including the unveiling of a memorial monument, had been planned as a final tribute to the ‘shaheeds’. The trip to Giyari ended with a gracious send-off by the Deputy Brigade Commander and one of the local Battalion Commanders. After relaxing for the rest of the day at Dumsum, we took leave from our hosts the following morning and set course for the return leg to Khaplu. The downhill bike ride was great fun and we even notched gale speeds of 55-kph. It was decided that we needed a break from the unceasingly tough regimen, and some sightseeing in Khaplu would be therapeutic. 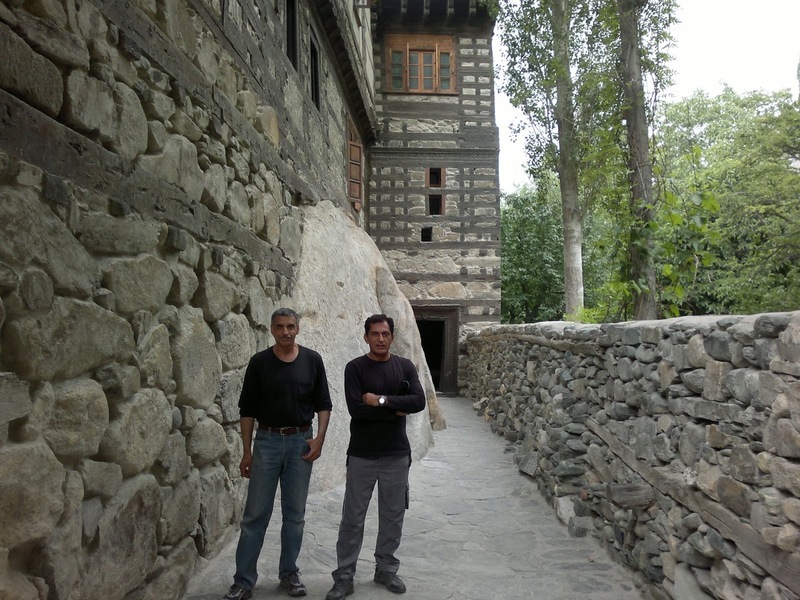 A visit to the Khaplu Fort Residency – also run by Serena Hotels – was an education in heritage conservation; its renovation by Aga Khan Trust was quite similar to the one at Shigar. We had lunch and some delicious Lavazza coffee, before setting off to see the old Chaqchan Mosque not too far from the Residency. The wooden mosque is said to have been commissioned by Mir Syed Ali Hamdani in 1381 AD (783 AH according to the plaque), making it one of the oldest in the country. The structure is rather decrepit and needs renovation on the lines of Khaplu Residency; however, being an in-use mosque of the dominant Nur Bakhshi Shia sect, the Ismailis' Aga Khan Trust would hardly be welcome to undertake the project. Next day, the ride from Khaplu to Keris was a familiar and unremarkable one. We decided to camp in a secluded spot by the riverside at the edge of Keris, to keep away from the prying eyes of locals. Somehow, a dozen youngsters still managed to spy us; perhaps it was the aroma of the noodles being cooked on the stove that attracted them, or maybe they had caught a flash of the colourful tents from afar. After shooing them off, we retired early to be up at dawn for another day’s slog. The tenth day of the expedition turned out to be the toughest, if for no other reason than the sun being absolutely merciless. On the way we stopped by a huge tree and were pleasantly surprised to see its boughs laden with ripe, dark red mulberries. Much like overgrown schoolchildren, we had a hearty fill devouring every mulberry within arm’s reach. Still some distance from Skardu, we were surprised to hear the noise of fighter aircraft which had deployed for an exercise. The nostalgia was boundless when we spotted a pair of the old faithful Mirages piercing the azure skies. It was to be another hour before we actually got to Skardu, choking on diesel fumes that have heavily polluted the city’s pristine air. Vehicles have been converted to the high-torque diesel engines with non-existent emission standards, and nobody seems to care as long as they can easily spin up a mountain. A consumption-oriented society is on the rise, as was amply evident from the array of consumer goods in the smallest of stores. We were, however, quite pleased to note that sectarianism, as it exists in other parts of the country as well as nearby Gilgit and Chilas areas, is non-existent in all of Baltistan. The people are friendly and peaceful, and seemingly the only curiosity about them is linguistic, for the Balti language belongs to the Sino-Tibetan family, unlike the rest of the country where languages belonging to the Indo-European family are spoken (the other exception being Brauhi of the Dravidian family). Baltistan surely has a place on the ethnographic map of Pakistan. While we waited for our return flight to Islamabad, we had a couple of days to saunter around so a tough bike ride to Satpara Lake and a jeep ride to Deosai Plains was also undertaken. All in all, the Baltistan expedition was a total success and the wonder was that at our age, we could manage it on muscle power. Let’s see if we can pull off another one next year to celebrate our official entry into the Seniors’ Club! This article was published in the daily newspaper The News International on 21 July, 2013. It was also published in Pamir Times, in two parts, on 22 July and 25 July, 2013. As our aircraft landed with a thump, I woke up to be utterly surprised at finding myself in Malé, the capital of Maldives, instead of Colombo in Sri Lanka. Unknown to me, a connecting flight via Maldives had been hurriedly cobbled up in Dubai after the original one got missed due to a late start at Lahore. The embarrassing feeling was like having boarded a wrong bus, but it did not last long as we took off for Colombo after an hour’s stopover. Business in Colombo pertained to a workshop on South Asian Stability, sponsored by the US Naval Post-graduate School and, involved Pakistani and Indian armed forces veterans and scholars, along with members of various think tanks and institutions from the US. Driving from the airport to the city, one could see shops lining all 35-km of the distance, with old terra cotta roofed buildings and quaint Victorian churches completing the colonial scene. Orderly traffic was the first thing that struck me. Buses were strictly following the bus lane. All motor-cyclists were wearing helmets, including pillion riders, whether men or women. The taxi driver would brake every now and then at zebra crossings, something I was quite pleased with when the same courtesy was extended to me later as a pedestrian on many an occasion. As I got off at the Taj Samudra Hotel, the taxi driver reminded me that all cricket teams stayed there. He said that the most popular of them all was the Pakistani team and the Sri Lankan fans often caused a traffic jam at the hotel premises while seeking autographs and pictures of their favourite players. Before the workshop started, I had a complete day to myself, so I decided to roam the streets of Colombo. The municipality seemed to be working most conscientiously, for there was no garbage to be seen anywhere and the streets were as clean as could be. All roads are being turned into one-way thoroughfares to ease traffic congestion. The serene Hunupitya Lake has a tree-lined walkway all around it and the young and old, jog and walk early in the mornings and late in the evenings. A facility known as ‘Friends in Need Society’ is a 182-year old institution located in downtown Colombo, dedicated to the care of the handicapped, especially the amputees of the civil war. Disabled adults and children are provided every possible medical help, including dignified reintegration into society. It was no surprise that there were no beggars to be seen in Colombo. The idea of such a benevolent institution is certainly worth emulating in Pakistan, if there are philanthropists willing to help. As the sun’s rays became more piercing, I hailed a rickshaw to take me back to the hotel. The driver asked for a rather huge sum of Rs 1,000, but after some haggling, came down a bit. Not impressed, I suggested something more reasonable, but when he learnt that I was from Pakistan, he immediately slashed the fare down to Rs 200. While driving back, he gave several reasons for his generosity: firstly, that Pakistan helped Sri Lanka quell the murderous insurgency, secondly, that our cricketers were very popular in his country and finally, that he was pleased to meet a fellow Muslim. I thanked Tasleem for the flattering comments which were offered in immaculate English which was no surprise, as the literacy rate in Sri Lanka is over 93%. Though religious tolerance is generally evident in Colombo, there have been some instances of bigotry, of late. The majority Sinhalese Buddhists (70% of the population) have objected to meat being certified as halal. Even the Muslim hijab is coming under criticism from some radical Buddhists and, there have been odd instances of attack on mosques. Despite this recent acrimony, Buddhists, Hindus, Muslims and Christians have a long history of peaceful co-existence and mutual respect of religious places, practices and traditions. This is evident as a mosque stands next to the famous Murugan Hindu temple; another main mosque and the Baptist Church Community centre share a common wall; yet another church and mosque stand on the two sides of a main road. It seems that extreme courtesy flows out of a tolerant attitude borne of a multi-faith and a multi-cultural society. I would not be off the mark in claiming that Sri Lankans are some of the most polite and considerate people on the globe and hopefully, they will be able to maintain this wonderful tradition in the future. During a visit to the Buddhist Gangaramya Temple, I happened to watch a wedding party receive the benedictions of the priests. Dressed in maroon saris (the colour of the Theravada Buddhist faith, also reflected in the national flag), the bridesmaids escorted the rather fat bride for a pooja ceremony. This was followed by a photo session, much like our never ending ones, in which every family member is roped in and forced to smile under sweaty brows or melting make-up. A stuffed elephant, which was a temple mascot when it lived, is still revered and the faithful make it a point to pray for its comfort in the Hereafter. While the workshop was in progress, the very appetising South Indian food started to take its toll on the waistlines, so evening walks had to be resorted to with vigour. During rush hour, walkways were full of people, with working women being in evidence in large numbers. Odel, an upscale shopping mall, was thronged with well-heeled Westerners who were willing to pay the inflated prices of the clothing and other items on sale. Tourists abound in Colombo, which serves as a springboard to other places of historical, botanical or zoological interest in the rest of Sri Lanka. A dozen top class hotels within a square mile of central Colombo attest to the increasing popularity of Sri Lanka as an affordable holiday resort. One day when we got an early off from work, a hunt for the fabled Sri Lankan gemstones turned out to be successful. Though this blue sapphire for a necklace pendant set me back by a fortune, the recipient of the gift (my wife, of course) was more than happy, as it turned out! One of the famous getaways of Colombo, especially for socialising couples, is the vast Viharamahadevi Park whose coconut palms, huge banyan trees and dense herbage provide much needed cover from the sun, as much from prying eyes. A golden statue of Buddha lords over the park, while the Town Hall, popularly known as the White House, forms an impressive backdrop. On one end of the park is the Cenotaph War Memorial built by the British in memory of the Ceylonese soldiers who fell in World War I; it later came to commemorate the fallen Ceylonese soldiers of World War II and, still later, those who laid down their lives while fighting the recently ended insurgency. The oddly-named Galle Face Green is a mile-long beach front promenade lined with palm trees, at the western end of the Colombo. It is a popular strip for jogging, as well as family outings on weekends. The elegant Galle Face Hotel dating back to 1864, is a prominent landmark on the Green. I went out for late night walks a few times and was quite amused to see kite flying at that late hour, with colourful kites having long streamers shimmering in a flood-lit sky. A drumming concert was underway, with hundreds of youngsters enjoying the merriment with abandon. Security in Colombo is flawless and, given the 25 years of insurgency that had badly racked the country, it is indeed commendable. Smart and courteous policemen can be seen at virtually every traffic crossing. During a VIP movement near the Presidential Secretariat, I was most politely told by a policeman to take a detour, “if it is not a problem, sir.” Except for military installations, roadblocks and checkpoints are non-existent. Even the GHQ, located right behind the Taj Samudra Hotel, gives a welcome look, with a bevy of military policewomen alongside their male counterparts guarding the main entrance. During my stay in Colombo, I noticed a virulent tirade by the media against India and US, for passing a UN resolution against supposed human rights violations by the government during the last stages of the counter-insurgency campaign. It seemed that the resolution had more to do with Sri Lanka cosying up to China, than anything else. The inauguration of the Chinese-built Hambantota Port in south Sri Lanka seems to have rubbed the two powers on the wrong side, I thought. Sentiment against interference by outside powers is strong for another reason too. Four and a half centuries years of exploitative rule by the Portuguese, Dutch and the British, has left an anti-colonial mindset amongst the Sri Lankans, and they strongly feel that they can handle their own affairs. To me, the short Colombo experience was a very pleasant surprise. The 18th century English man of letters, Horace Walpole, coined the word ‘serendipity’ describing such accidental discoveries which the heroes of the Persian fairy tale, The Three Princes of Serendip, were always making. To relive those discoveries – or to experience serendipity – one must first hearken to Colombo’s call and then delve deeper into enchanting Sarandib of the Arabs and Persians, which is none other than the beautiful Sri Lanka of today. This article was published in the daily newspaper The News International on 19 May, 2013 under the title Serendipity in Essence.